threeASFOUR is a trio of transnational artists based in New York City who use fashion as their primary medium. In 2015, threeASFOUR were the recipients of the Cooper-Hewitt/Smithsonian Museum’s National Design Award. Their work has been the subject of various exhibitions including Making/Breaking, Cooper Hewitt National Design Museum (2017); Force Of Nature, Museum at F.i.T, New York (2017); Manus x Machina, Met Costume Institute, New York (2016); #techstyle, Museum of Fine Art, Boston (2016); The fantastic journeys of energy, Kappatos Gallery, Athens (2016); tree of life, Mana Contemporary Art Center, Jersey City (2016); Fashion Underground, Museum at F.i.T, New York (2016); Body Embellishment, Mint Museum, North Carolina (2015); TOPOGRAPHIC, Canzani Center Gallery, Columbus, Ohio (2015); Dream Weavers, Beit Hatfutsot Museum, Tel Aviv (2015); Killer Heels, Brooklyn Museum, New York (2014); Folk Couture, American Folk Art Museum, New York (2014); Meet D3 Design District, Dubai UAE (2015); FEST, Performa 13, New York (2013); MER KA BA, Jewish Museum, New York (2013); juliaSET, White Columns Gallery, New York (2012); Mode Biennale, Arnhem, Netherlands (2011); New York Minute exhibition, Garage Gallery, Moscow, (2011); Insalaam Inshalom, Beit Ha’ir Cultural Museum, Tel Aviv (2011);Interwoven , Textile Museum, Washington DC, (2011); Superheroes, Costume Institute, Metropolitan Museum, New York (2008); New York Fashion Now, Victoria & Albert Museum, London (2007). Their designs are in the permanent collections of the Victoria and Albert Museum in London, the Met Costume Institute in New York, the Cooper-Hewitt National Design Museum in New York, the Museum at F.I.T. in New York. Das Modedesignlabel „Threeasfour“ nutzte für zwei Designerstücke seiner neuen Kollektion „Biomimicry“ die Additive Fertigung. Die beiden Modeinnovationen aus Elastomer wurden mit dem „Objet500 Connex3“ von „Stratasys“ gedruckt und waren ein Hingucker auf der letzten New Yorker Fasion Week.Stratasys nutzte hierfür ein neues Material aus der Nanotechnologie, welches besonders flexibel und haltbar und nicht nur für die Modewelt, sondern für verschiedenste industrielle Bereiche einsetzbar ist. Doch erst mit dem Multimaterial- und Multifarb-3D-Drucker „Objet500 Connex3“ konnte das Designer-Trio seine Ideen vollends verwirklichen. 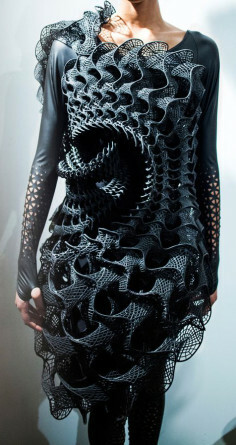 La marca neoyorquina Threeasfour presentó el mes pasado un par de vestidos impresos en 3D basados en el diseño de diversas formas y texturas biológicas. Como parte de la colección de otoño 2016 titulada Biomimicry, los vestidos -llamados Harmonograph y Pangolin – pretenden demostrar las “posibilidades que se entrelazan entre la moda, el diseño y la tecnología”, comentan los creadores de la marca. Gabri Asfour, Angela Donhauser y Adi Gil tienen muy claro cuál es su objetivo en el mundo del diseño. Siempre con un paso adelante, el trío de diseñadores se caracteriza por los diseños complejos y el uso y reuso de materiales inusuales.